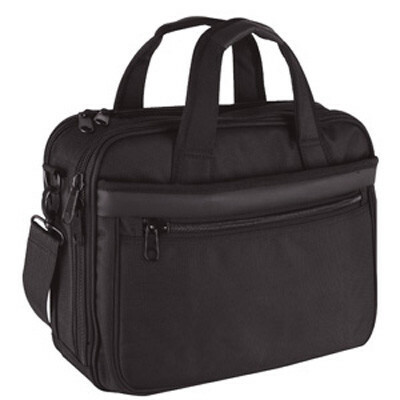 Features: Water resistant 1680D Ballistic nylon with PU trim, rear open file sleeve, adjustable & padded shoulder straps, metal fittings, expandable gusset, 3 zippered compartments for Notebook or Tablet,files and accessories. Exit Stock Item. Check stock levels. Product Colour: Black. Product Size: 380 x 270 x 40 mm - 15.4” Notebook compartment. Print Area: 90 x 85 mm. Delivery: 1-7 days (stock) from order. Accessory Options: AC001: Lanyard, AC002: Mini Lanyard, AC003: Split-ring, AC004: Split Ring Chain, AC005: Snap Hook, MB5047As: 3n1 Charge Cable (Stock). Standard Packaging: Poly bag. Packing Details: 10 pcs per carton, 12 Kgs, 41x40x67 cms. Setups: Included.